All of these shortcuts operate from the Day/Week/Month views of Outlook. Display from one to nine days on the calendar with Alt+1-9. Select Alt+- to show the week based on the start date indicated in your Calendar option settings. 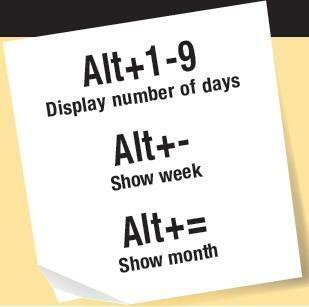 Show a whole month for the day or week selected, from the beginning to the end of the month using Alt+=. Outlook's Conversation view--what's the point?